Special thanks to Brian for sending this one in. 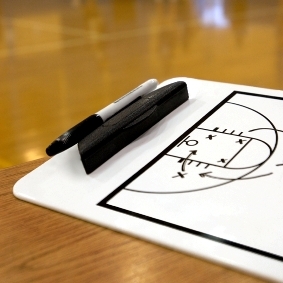 If you’re looking for a fresh [tag]youth basketball coaching resource[/tag], try this out–a fast-paced [tag]basketball passing drill[/tag] that will show immediate results! Passing and catching [tag]basketball drill[/tag]. I put all the boys in circle arms length apart at the center of court. Everyone takes 5 steps back to widen the circle. I coach from the middle of the circle. One boy has a [tag]basketball[/tag] and bounce or chest passes to the next boy until we complete the circle. We are concentrating on making eye contact with the next player, stepping to the player making a sharp pass. The receiver has to step to the pass, secure the ball, use his pivot foot and pass to the next boy. I will time the boys to see how long it takes to complete the circle. I will introduce a second ball half way around the circle and possible a third ball to the circle. This keeps the boys attention and helps with speed and passing fundamentals. After 5 times around the circle I will have the [tag]basketball coach[/tag]es play passive defense on the inside of the circle to help the boys make good passing decisions.